Description: Mississippi River & Bonne Terre depot; nicely restored. The road's shops were across the street at one point. Description: Motive Rail (MRIX) GP10 8344 at the road's Scott City shop in 2006. Description: A pair of KCS Geeps bring a local into Sater in September 2006; at one time the town had a roundhouse and shops for the Alton RR. Description: The former RI/ATSF line between St Joseph and Atchison was washed out at Winthrop MO by a flood in 2011. As of 2012 the line is still out of service. See Zach Pumphrey's shots of this same location to see what nature did to it. UP 5652 sits with an empty coal train during more normal times. The tracks to the right are what's left of the old BN/CB&Q branch from Armour, which was abandoned in the late 1980s. Description: NS GP50 7027 at Mexico MO in 2006 with sister 7038. Description: It's probably safe to say that not many Bangor & Aroostook units ever went through Mexico Missouri; 355 is one of two dead-in-tow on the KCS enroute their new owner WAMX in Kansas. Description: KCS is moving the horsepower as an incredible eleven units head west through Mexico MO on the former Gateway Western. Up front two each EMLX SD90s and KCS GP40s are actually working with seven dead diesels in trail, all bound for WAMX in Kansas. They include five A&O (ex UP) SD50s and two BAR GP38s. A pair of NW GP50s look on to the left. Description: BNSF removed the diamonds for the CBRM crossing at Sumner MO in late 2006 and unceremoniously deposited on the south side of the old crossing. 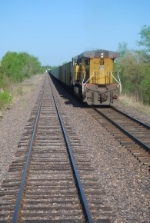 The road had ceased serving the line south of Chillicothe in 2005 and filed for formal discontinuance in Feb 2007. 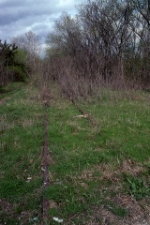 Description: A long line of railroads have operated the former Wabash line across northwest Missouri; this is what's left of the route at Sumner MO, awaiting removal. Description: This is the state of the former RI's "mainline" across Missouri, 27 years after the last train rolled over it. Nature is slowly consuming what's left; this portion is in the small Cole County town of Henley. Officially the line has never been abandoned- but any attempt to reopen it will undoubtedly require an untold amount of money as well as years in court to fight adjacent land owners. Description: This is what's left of Rock Island's cross-Missouri main after a quarter century without a train. The Miller County town of Eldon was the route's crew-change point and boasted a roundhouse and yard. In spite of the fact that the tracks are still in and the line has never been officially abandoned, the chances of it ever seeing a train again seem slim to none. Description: This is Henley MO, at one time a small town on the Rock Island's cross-Missouri line as well as a junction for the little-known Hickory Hill RR. Although not formally abandoned, there hasn't been a train through here since 1980, which is probably the age of the trees which cover the roadbed and rails, which are just visable in the lower right hand corner. Description: NREX 8545 leads an eastbound KCS freight across highway 79 at Louisiana, MO. The Mississippi River bridge is immediately ahead. Description: The Asplundh weed sprayer train heads east over the Mississippi River Bridge at Louisiana MO; the HELM SD40-2 is followed by a tank car, the weed sprayer car with three men manning the hoses, four more tank cars supplying the herbicide and a KCS boxcar bringing up the markers. Description: Helm SD40-2 6236 leads an Asplundh weed spraying train on the KCS across MO79 at Louisiana MO while the boys in back carry out their trade and hose things down. The BNSF crossing and Mississippi River bridge are right ahead. The crew thoughfully held fire as they passed the photographer. Description: I left Missouri in 1978 and came back to live in St Louis in 2004. TRRA was always switchers from my memory, either EMD or AlCo, and the idea that they'd ever get big six-axle power was definately odd. Nonetheless, that's what they got- and here are two of them, shot near Grand Avenue in St. Louis proper. Description: Power waits at the MNA's Carthage, MO facility in the summer of 2007. MNA 4164 is a road slug actually in storage. GMTX 2628 is former CSX 1985. Description: Now that it appears that MNA is getting rid of their GP40 fleet in favor of 'new' ex-UP SDs; we recall the previous fleet of GP40 mongrels resting at Carthage. Description: The Ozark Valley RR took over the KCS's former ICG/GM&O/Alton Fulton branch in 2007. First power for the new line was from sister road Bountiful Grain & Craig Mountain in the form of BGCM 3003. It's shown here in July 2007 within a day or two of arrival. In Nov 2009 it moved on to another shortline in South Dakota. Description: Missouri Farmer's Association (MFAX) SW1200 1242, ex TRRA 1242, at Higginsville MO. This unit was replaced by an MWLX GP18 in late 2014/early 2015. Description: Almost the dead of noon (and harsh sun) and I stumble on this entourage; Eight NREX units, most SD40-2s or derivitives, are on the BNSF's Hannibal Sub and headed for South America. Up front is BNSF 4856 and NS 7662; trailing are NREX 7378, 8251, 5600, 5637, 5848, 5703, 8387, 5479. Description: Only the two BNSF GEs up front are pulling this one as nine NRE units are moving west (south) on the BNSF K-line at Elsberry MO. The lot is bound for South America. Description: A westbound UP local drills through Dexter MO behind a LLPX unit. Description: You don't see many small Vulcan units on display, but here's an 8 tonner in a park in the small Missouri bootheel town of Morehouse, which used to be home to a large lumber operation run by the Himmelberger-Harrison Company. One source says it dates from 1928 having originally been built for Canal Construction of Memphis. Description: A pair of MRIX Paducahs sit by the company's Scott City shop in September 2006. 8342 displays full markings while sister 8329 sits after getting a fresh coat of blue. Description: Ray Carroll Co-Op GP9 6550 peaks out from behind a shed at Norborne MO. It's one of at least four units the company uses at elevators in Western Missouri. Description: A pair of GEs (6450/6540) run an empty coal train west through Otterville MO; an SP AC44 (257) is working as a DPU behind. This is the Sedalia Sub on the former MP. Description: MNC 4485 at Chillicothe; a fascinating combination of fresh black, faded gray, rust and peeling letters. 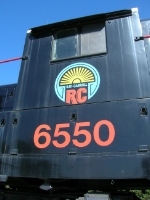 The locomotive is owned by the City of Chillicothe and operated by Motive-Rail under their lease agreement as the MNC. Description: Both of the units that work Missouri North Central hang out by the tombstone maker in town; MRIX 8316, MNC 4485. 8316 is former PAL 8316, IC/ICG GP8 7909, originally IC GP9 9194. Description: Frame Number stamped in left-rear location of MRIX 8316. the frame came from IC GP9 9194, rebuilt at Paducah as GP8 7909, to PAL 8316, to MRIX 8316. This unit has been identified elsewhere as the former IC 8909, which carried f/n 6495-4. Description: Two units bring a grain train westbound on a glorious late December day on the BNSF Hannibal Sub. Description: PSC Metals, also known as Phillip Metals, operates a number of scrap and recycling centers. Actual reporting marks are unknown; SFRX reporting marks (as on the gon behind) are assigned to one of the company's branches. The St. Louis site uses SW1 601 in its junk yard adjacent to the McKinley Bridge. Judging from the number and details, this should be the former Granite City Steel 601. Description: BNSF GP39E 2932 leads a pair of other units (GE 4533 and SD60M 8139) on a freight running east (north) on the K-line. The train is actually a few miles south of Clarksville and rounding a knob known locally as Kissenger Hill. Description: A southbound (westbound by timetable) train runs on the BNSF K-Line along the Mississippi River on 5 April 2008 behind BNSF 5103 and KCS 4580. The closer bridge is for US36, the structure in the background is the NS (ex NW, WAB) lift bridge, which is shown in its up positon for river traffic. The tracks in the foreground are NS- they take a cut to the left about 200 yards away and then make a hard reverse turn through a curved tunnel that pops out to cross the BNSF and then the bridge. Description: Three NS units (9615, 9147, 5105) lead a westbound freight through Hannibal MO as the rails turn from along the river back towards the west. Not much remains from the city's railroad heyday. At the start of World War II the CB&Q, Wabash, St Louis & Hannibal and Hannibal Connecting (in nearby Ilasco) were all here, and the Burlington had a substantial divisional roundhouse and shop complex located just south of downtown. Now BNSF bairly slows down as it passes through while NS has a small, underused yard on the west side. Description: Amtrak train number 314, the Ann Rutledge, loads passengers at Kansas City Union Station. P42 191 leads four Horizon cars and will depart promptly at its scheduled 7:30AM time. Note the historical railroad heralds placed on the pedestrian bridge overhead. Description: Amtrak Horizon coach 54029 is the fourth car in Amtrak's Ann Rutledge and is in siding at Strasburg while an empty UP coal train passes on the main to the left. Description: An empty UP coal train works west on the road's Sedalia subdivision with GE 7000 pushing in distributed power mode. The coal train is on the main while Amtrak 413 waits in the siding for it. The Sedalia sub is largely used for westbound UP freight while eastbounds normally operate on the parallel River Sub, located further north. Amtrak's St Louis-bound eastbounds have to dodge freights through the eight sidings on the 157 mile single-track portion to Jefferson City, which usually slows progress considerably. Today's train left KC on time and will arrive Jeff City 45 minutes late. This picture was shot out of the rear window of a Horizon coach. Description: We're at River Junction, MP128 on the UP (ex MP) Sedalia Sub, about 2.5 miles west of the Missouri state capital of Jefferson City. The eastbound Ann Rutledge (tr 413) has crossed from track 2 to number 1 and stopped to allow the Missouri Mule (train 311, shown here) go by on its way to KC. 314 will now back 200 yards or so and cross back to track 1 before proceeding into the Jeff City station for its stop. The silhouette to the right is the train's conductor, who will observe ther reverse movement. Description: An empty coal train approaches milepost 61 on the BNSF "K"-Line behind a pair of SD70MACs; there's no DPU today.